Daniel Greenfield: "Trump Divides Americans And Un-Americans"
The New American Moment laid out a “clear vision and a righteous mission -- to make America great again for all Americans.” But not everyone who happens to live in America wants it to be great. President Trump’s speech wasn’t divisive. But it did divide. It divided those in the House Chamber who love this country from those who don’t. It divided those who honor our troops, our anthem and our flag from those who take a knee. It divided those who want to make America great again from the left. 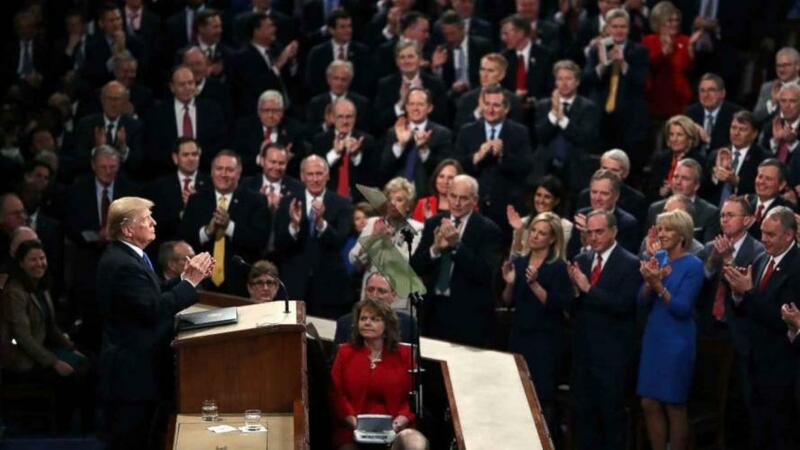 The State of the Union vision exposed the divisions between America and un-America. We saw a child honoring veterans, the grieving parents of children murdered by illegal aliens and a true refugee who had fled the Socialist tyranny that un-American leftists want to bring to this country. We saw small businessmen, hard workers, soldiers, police officers and an elected official shot by a Bernie Sanders supporter who wouldn’t let a murderous Socialist stop him from fighting Socialism. We were reminded what we are capable of. And we were reminded of how much the left hates that. President Trump’s State of the Union address was more than a great speech. It was our story. It was a reminder of who we are and what makes us great. It was the living soul of America soaring once again. Americans, on the left and the right, are told every day who we are by an un-American media and its entertainment industry. We’ve been told it so often that it’s easy to forget who we really are. A great speech doesn’t just score political points. It does more than move us. It wakes us up. And President Trump’s State of the Union speech wasn’t just the greatest political address of his career. It’s the greatest American speech of the century. There have been significant un-American speeches that told us the traditions we believed in were dead, that the country we knew would never return and that we must become compliant citizens of un-America or be left behind on the wrong side of history. President Trump succeeded by echoing the anger, the pain, the outrage and the common sense of a frustrated America. Some pundits found the echoes of this insurgency abrasive, disconcerting or vulgar. But this was not an insurgent speech. It wasn’t a call to arms. Instead it was a celebration of the changes wrought by the people’s revolution in Washington D.C. and of the growing power of a restored America. It was a story told through the people who were living it. Through the ordinary heroes who rush into the great catastrophes of floods and firestorms, and the ordinary catastrophes of homelessness and misery. The heroes of President Trump’s New American Moment, in his words, “live not only in the past, but all around us -- defending hope, pride, and the American way.” American exceptionalism isn’t in the past. It’s in the present and it’s all around us. History didn’t end a hundred years ago or in the last generation. The 2.4 million jobs, the 200,000 manufacturing jobs, the $8 trillion in stock market gains, the new bonuses and investments weren’t ordered by the government. They’re the bonuses of freedom. When the government cuts taxes, slashes regulations and frees us from the burden of bureaucracy, we prosper. "Together, we are rediscovering the American way," President Trump declared. "In America, we know that faith and family, not government and bureaucracy, are the center of the American life. Our motto is 'in God we trust.'" But the left’s motto is, “In Government we trust.” And only when they’re in charge. The left thinks that the ultimate power lies in government. That is why they’re scrambling to take over. It’s why the 2020 primaries are already looking like a clown car of senile senators and affirmative action wonder boys and girls. It’s why their judges are trying to block everything that President Trump does. But the real power in this country lies with the people. “We are appointing judges who will interpret the Constitution as written,” President Trump declared. He spoke of protecting the “Second Amendment” and “religious liberty.” “We have eliminated more regulations in our first year than any administration in history,” he informed Americans. He called for holding Federal employees accountable and freeing Americans to make their own decisions. He celebrated the death of the ObamaCare mandate and the growth of individual initiative. Huge tax cuts are being met with incredible job growth in business across the country. The New American Moment is built on empowering Americans by recognizing that the people of this country are not an interchangeable mass of social problems, but an exceptional nation. In the State of the Union, President Trump committed to securing jobs and opportunities by protecting our physical and economic borders. “The era of economic surrender is over,” he declared. Bad trade deals will be renegotiated and open borders that allow “millions of low-wage workers to compete for jobs and wages against the poorest Americans” will be made safe and secure. The government of this nation will work for its people instead of for the special interests of the left. The un-American left plies us with the dreams of others. It prods us about their suffering. It tells us their stories. And it insists that we are to blame for their pain. But it doesn’t care about our pain. The Democrats who sat through the stories of suffering and courage showed that they didn’t care. The forgotten American men and women whom the President of the United States led out of the shadows never mattered to them. But in the State of the Union, President Trump showed us their dreams. The American Dream was here long before the dream of illegal migration. It will be here long after the wall is built and Islamic terrorism is defeated. And yet so many of us have come close to forgetting it. The un-American left has filled our heads with its dreams and at times we can no longer dream our own. In the State of the Union, President Trump reminded us of our dreams and of the American Dream.